You would think that cyclists only worry when it comes to injury is being hit by a vehicle while travelling on the road (and if you have been hit then you should go to a personal injury attorney to help get compensation) but they suffer from long term strain injuries like orthoses as well. The cycling population tends to present less frequently with foot issues compared with other athletes, and that’s a good thing. Because, while finding the right design and materials for any patient is a challenge for practitioners who fit foot orthoses, when that patient is a cyclist those challenges are magnified. Factoring into the equation is how well a device will fit in the cyclist’s shoes, which typically don’t leave much room to maneuver. Orthoses have to be fairly thin. Material selection and other design elements, however, depend on the diagnosis, the cycling discipline, and the practitioner. Extremely rigid carbon or polypropylene footbeds may be appropriate for elite track cyclists but may be unsuitable for a recreational endurance cyclist. Some practitioners use ethylene vinyl acetate (EVA), a low-cost foam that provides comfort with maximum contact but minimum pressure. Freedman, who is also coach emeritus for the Columbia University cycling team, cited a 2003 Foot & Ankle International study that found cycling shoes made with carbon fiber produced peak plantar pressures 18% higher than those of plastic design (121 kPa vs 103 kPa, a statistically significant difference).1 But competitive or professional cyclists suffering from metatarsalgia or ischemia should be careful when using carbon fiber cycling shoes, Freedman warned, because an increase in peak plantar pressure may aggravate these foot conditions. But stiffness isn’t the only variable that needs to be considered, said Géza Kogler, PhD, CO, who is the director of the Clinical Biomechanics Laboratory in the School of Applied Physiology at Georgia Institute of Technology in Atlanta. “Making a global statement that the stiffness of a material, in this case for an orthosis, is going to illicit higher peak plantar pressures in the foot is really misleading,” said Kogler, who teaches lower limb orthotics in the Master of Science in Prosthetics and Orthotics program at Georgia Tech. “The stiffness is only one characteristic. The interface geometry of the orthosis, such as one designed to be a total contact system [eg, a custom-molded orthosis], is likely to have a greater influence on plantar pressure redistribution than the stiffness of the material. Former professional cyclist Greg Bourque is the director of Peak Performance, an athlete testing facility at San Diego Sports Medicine. Given the shoe volume issue, coupled with the possibility of an individual’s foot swelling a half shoe size during the course of a day, Bourque elects not to use custom-molded orthoses for cycling. He prefers off-the-shelf inserts. He likes devices that provide different arch heights, have varying widths, and have some degree of cushion. By comparison, Freedman is not a fan of cushioning in cycling orthoses. Orthotic modifications, like posting, can positively affect cycling mechanics. Posting becomes important for sharing the load and creating the required alignment, experts say. Adding wedges can help align the biomechanics of the leg to maximize power. Wedging shims are fitted under the forefoot outer sole of the cyclist’s shoes between the shoe and the attached cleat. They can also invert or evert the shoe with the addition of wedges under the cleat. Tribino also noted that the bike needs to be factored into the equation. Because volume, shape, and construction are factors with cycling shoes, Freedman doesn’t typically add to the orthosis. Because of the volume limitations of cycling shoes, such as a narrow toe box, some won’t accommodate regular shoe orthoses. Besides just fitting into a cycling shoe, biomechanical considerations include the correct arch height, the weight of the device, its width, and other factors. Attached to the bottom of a cycling shoe is a rigid cleat designed to clip into the clipless pedal. Pedal technology, such as clipless pedals, rotational freedom, or float (the degree of mobility the foot has when it’s clicked into place) affects orthosis prescriptions. Some pedal systems allow the rider to adjust the degree of float, as well as the direction in which the float occurs. For example, one pedal system offered for road bikes has a 15° release angle. It also has a lateral float of 6°, which means the rider’s foot can move 3° mediolaterally to the left or right. According to industry experts, the total float range is 0° to 37°, with 90% of pedal systems having 3° to 9° of float. The direction of rotation can be adjusted completely in some pedal systems and can be rotated to bias the location of float in other systems. If a cleat were hypothetically “centered” on a shoe, it would have 50% of its total float in each direction. Float is good for the typical cyclist because it essentially “allows” for poor cleat placement, said Daniel Swatton, product manager at Delcam, a Birmingham, UK-based supplier of advanced CAD-CAM solutions for the manufacturing industry, including orthotic solutions. He’s also an avid cyclist who wears orthoses. Too much float, however, can be problematic. “The amount of float is very important and a good bike fitter will give you the right amount of float under each foot and minimize the risk for excessive float,” Swatton said. In some cases excessive float can lead to knee pain, as the knee compensates for the instability at the foot. Excessive float can also negatively affect cycling performance. “If the foot is not stable in the shoe, it moves in the shoe,” Freedman said. “If it’s moving in the shoe—and not necessarily in a controlled way—then the cleat is not floating on the pedal. An orthosis stabilizes the foot, keeps the arch from collapsing, and helps with better transmission of energy to the pedals with less stress on the joint. Tribino said the orthoses she recommends for cyclists may differ a great deal based on these variables. “Again, it’s important to augment the orthoses for the individual patient’s symptoms, alignment, and biking equipment,” she said. 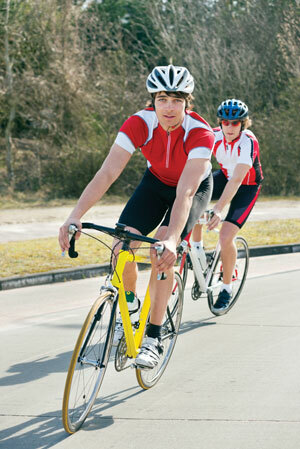 In general, more knee movement during cycling means more need for rotational freedom at the foot. Tribino doesn’t subscribe to the notion that specific types of cycling (such as mountain biking, road biking, track cycling, or triathlon biking) affect foot orthosis prescription. Other practitioners say they apply different prescriptions based on the different disciplines. Even the skill level of the rider—recreational versus competitive—can play a role. McGlynn noted that each type of cycling has different power, shoe, and pedal dynamics, and, while the activity is broadly similar across all elements, there are also differences. 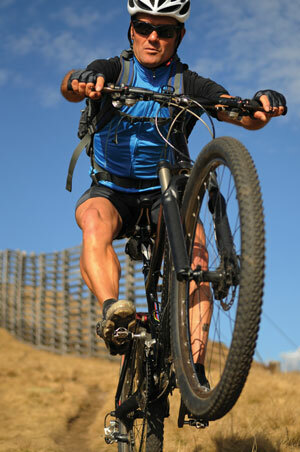 Kogler noted one of the major differences with mountain biking is that, when ascending a mountain, the cyclist is out of the saddle and thus bearing more weight on the foot. This could lead to more injuries than would be the case for cyclists who spend most of their time seated. Freedman also identified the differences he is confronted with. Freedman also said he may add extra padding in the heel for shock absorption in certain cycling disciplines, such as cyclocross or mountain biking, in which the rider may get off the bike to run with it or to climb. “It all depends on the needs and the skill level of the cyclist,” he said. Bourque also cited the power transmission factor in track cycling, and noted that stiffer materials often facilitate greater power transfer for pedaling. Swatton noted that, since road riding requires the cyclist to be in the same position for many hours, the need for excellent biomechanics is acute. “But with mountain biking, you are often in and out of the saddle [ie, in multiple positions], so orthotics have not been so widely needed or adopted,” he said. How often cyclists need to replace their orthoses depends on a number of factors, including skill level, type and density of orthotic material, wear and tear, and changes in the foot structure. Freedman said it’s typically between 18 months and four years. Bourque recommends replacing orthoses every season for the everyday cyclists—and pro cyclists, whom he said average 20,000 miles or more a year, might change them more often. McGlynn also said that athletes who use higher density materials may need less frequent replacements but may require replacement of top covers or modifications made as shoes, equipment, or needs change. Experts say cyclists use orthoses for a multitude of reasons, including repetitive overloading, which can cause metatarsalgia, pain, and inflammation in the ball of the foot. Or they may be experiencing residual knee pain, chronic iliotibial (IT) band pain, patellar tendinitis, Achilles tendinitis, or hip or lower back discomfort because of their foot mechanics. Bourque also identified a high arch as a common indication for orthoses. An orthotic intervention can offset these issues. However, Kogler said wearing foot orthoses in everyday life doesn’t necessarily translate into needing them for cycling. The bottom line is that cycling foot issues are unique to this sport, and subsequently, so are the solutions. 1. Jarboe NE, Quesada PM. The effects of cycling shoe stiffness on forefoot pressure. Foot Ankle Int 2003;24(10):784-788. 2. Baur H, Hoffmann J, Reichmuth A, et al. Influence of carbon fiber foot orthoses on plantar pressure distribution in cycling. Sportverletz Sportschaden 2012;26(1):12-17.